Psychiatrist Kay Redfield Jamison writes with eloquence about an illness that's too long gone undiscussed. "People don't realize how much suididal people hurt, how long they hurt, and how hopelessly they hurt," says Jamison. 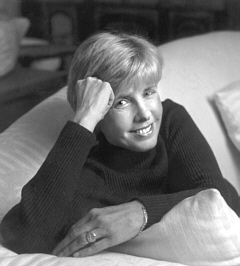 Poetry is woven through Kay Redfield Jamison's work like gold thread ornamenting a dark sweater. It is in the titles and throughout the text of some of her books. Stephen Spender, Edna St. Vincent Millay, Seamus Haney, Robert Lowell, Theodore Roethke, Randall Jarrell, Delmore Schwarz, John Berryman, Lord Byron...all mingle freely with Jamison's scientific data and knowledge. "In the real world, poetry and science are combined," says the Hopkins professor of psychiatry. "There's no one who describes emotions better than writers. You're not going to get psychologists and psychiatrists to describe it better, that's for sure, or chemists and physicists." Few people, be they scientists or poets, describe the intense, sometimes exhilarating, more often relentlessly awful emotions of mood disorders better than Kay Jamison. She is a much-respected researcher and clinician. She co-authored with Frederick K. Goodwin the definitive medical textbook Manic-Depressive Illness. Her writing elicits admiration from the likes of Oliver Sacks, Robert Coles, and Nobel laureate James D. Watson. She is the rare scientist who appears on the New York Times bestseller list, and she is an honorary professor of English at the University of St. Andrews in Scotland. She is also mentally ill. Her last two books, An Unquiet Mind: A Memoir of Moods and Madness (Knopf, 1995) and Night Falls Fast: Understanding Suicide (Knopf, 1999), have been or included candid accounts of her own manic-depression and suicide attempt. Jamison first came to the attention of a public beyond psychiatry in 1993 when she published Touched With Fire: Manic-Depressive Illness and the Artistic Temperament (Free Press, 1993). In that book, she examined the striking number of artists, poets, novelists, and composers who exhibited the symptoms of mood disorders, including Byron, Vincent Van Gogh, Virginia Woolf, and Edgar Allan Poe. But it was An Unquiet Mind, two years later, that brought her to national prominence. A brave, heartbreaking memoir, the book recounts Jamison's lifetime of coping--and sometimes not coping--with her illness. While promoting that book, Jamison's next subject was all but forced on her. She says, "When I was on my book tour, the thing that moved me the most was the people who came up afterward and talked about a child or parent or brother or sister who had committed suicide. A lot of them would bring up pictures. I was hit by how little discussed suicide was." Every year, 30,000 Americans kill themselves--one every 17 minutes. From 1980 to 1992, the rate of suicide in children ages 10 to 14 increased 120 percent, and in a 1997 survey, one in five high school students said that he or she had seriously considered suicide. Suicide is the second leading cause of death among college students. Yet many parents who check to see whether the campus has a climbing wall in the athletic center never think to ask about the university's mental health program. "These are people who are really intelligent and obviously love their kids," Jamison says. "It's not a question of caring or education, but a question of just not thinking about suicide. It's a harrowing topic, frightening for good cause. It's bleak. It's associated with illnesses that are very stigmatized." The net effect, she says, is that we've avoided "talking about a major health emergency." Jamison hopes that her book better conveys an understanding of the pain endured by the suicidal. She notes, "There's a tendency to think [of a suicide as] someone who just lost a job and went and killed himself. People don't realize how much suicidal people hurt, how long they hurt, and how hopelessly they hurt." It is in her combination of science, humanism, and personal openness that Jamison has made her mark. She hadn't planned it that way, but as Roethke said (quoted in Touched With Fire), "The edge is what I have." And in An Unquiet Mind she wrote, "The Chinese believe that before you can conquer a beast you first must make it beautiful." If you've had any direct personal experience with mental illness, you cannot read that book without tears in your eyes. Or without gratitude for Kay Jamison's eloquence, and the courage of her candor.